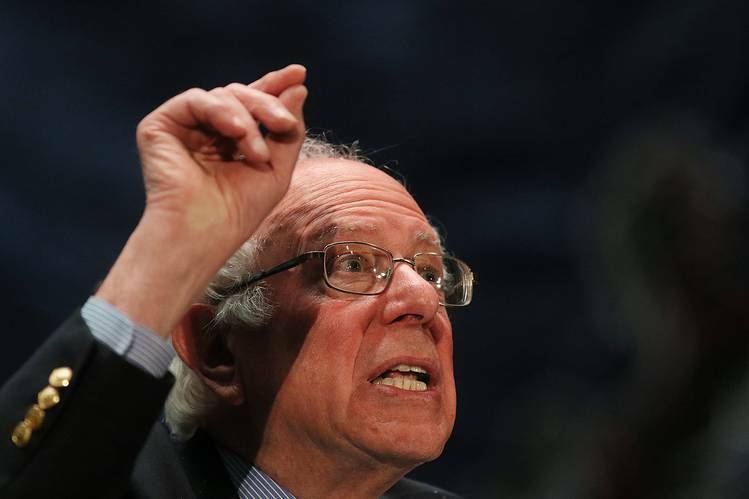 Bernie Sanders continues to attack Hillary Clinton while campaigning in Pennsylvania. I’m glad that he is not listening to party leaders who think he should back off. This is not a case of one Democrat with similar views running against another Democrat with similar views. There is a large ideological difference between the candidates, and the fight should continue regardless of how difficult it might be for Sanders to win the nomination. Former Obama speech writer Jon Favraeu has been writing articles lately about how he learned to like Hillary, and why we should too. Today he wrote, “Primaries are often a clash of personalities and magnified policy differences.” No this is not about personalities (other than Clinton’s dishonesty) and the policy differences are rather major. I have opposed Clinton this year for the same reasons I opposed her in 2008. More significantly, I oppose her for the reasons I opposed the reelection of George Bush in 2004. Her militaristic foreign policy views, conservative views on civil liberties, and opposition to government transparency are little different from the views of the Bush administration, and are unacceptable, regardless of party. Hillary Clinton probably could move the country much further to the right than Donald Trump or any Republican can. The same partisan Democrats who would loudly protest conservative actions from Republicans will defend the same actions if promoted by Hillary Clinton. We already saw how much Bill Clinton moved the country to the right when he was president. “I want to see the Democratic party have the courage to stand up to big money interests in a way that they have not in the past, take on the drug companies, take on Wall Street, take on the fossil-fuel industry, and I want to see them come up with ideas that really do excite working families and young people in this country,” Sanders said. The problem is that, regardless of what the platform says, Clinton will probably do what she chooses if elected. When hearings were underway to confirm her as Secretary of State there were concerns about conflicts of interest. In response to such concerns, Clinton agreed to divulge the names of all contributors to the Foundation while she was in office. Clinton failed to provide this information, while making unethically making decisions regarding parties which were contributing to the Foundation, or paying Bill unprecedented amounts of money to give speeches. She has continued this pattern of unethical behavior after leaving office. In order to promote increased transparency after the Bush years, Obama instituted stricter rules to limit the use of private email, which Clinton then violated. If Hillary Clinton failed to abide by rather limited agreements to act in an ethical fashion before she was confirmed as Secretary of State, why should anyone believe she will pay attention to any progressive planks she allows in the Democratic platform in order to obtain the support of Bernie Sanders? She has demonstrated too many times that she cannot be trusted–and certainly should not be trusted with the powers of the presidency. Posted in Barack Obama, Bernie Sanders, Bill Clinton, Civil Liberties, Donald Trump, Foreign Policy & National Security, George Bush, Hillary Clinton, Politics, Scandals. Tags: Barack Obama, Bernie Sanders, Bill Clinton, Donald Trump, Hillary Clinton, Iraq, Libya, Politics, Scandals, Syria. RSS feed for comments on this post.. TrackBack URL. WE NEED TO BE PREPARED with at least 900,000 signatures endorsing Bernie as an Independent if he does not receive the Democratic nomination this July. THIS means we need people on the ground collecting signatures in person in every state in the nation and we need to pay the filing fee in each state and hand in the signatures on time in each state. This collecting of the signatures could be, if I understand correctly, done prior to the Democratic Convention and only used if necessary. WE NEED BERNIE TO RECEIVE THE DEMOCRATIC NOMINATION, but with all the election fraud happening…this could be difficult. I would like our candidate to still run if he doesn't get the nomination as a Democrat. Switching after the JULY convention to Independent may be the way to make Bernie our next elected President. Write-ins do not work because only about half the states even look at the write-ins. About half of the states do not count write-ins on the ballot. They are thrown out. So when people on FB talk about writing Bernie's name in, I want to stop them and explain that if we really want Bernie to be our next President we have to keep on keeping on in the avenues that are permitted in all 50 states. Get your friends and neighbors to vote for Bernie in the Primary Season. But then let's all be prepared to take him to the White House as an Independent. REGISTER as a DEMOCRAT to VOTE for BERNIE and then after the primary season and after the Convention if the superdelegates do not nominate Bernie, I am not giving up. I think united we can bring Bernie to the White House either on the Democratic ticket or as an Independent. We need to get organized and someone close to Bernie needs to share these thoughts with him. I am thinking that Bernie may already be like-minded on this. I have been listening to him and hearing a slightly different choice of words since NY and I think he realizes that with the election system so rigged that most of his supporters want to rally around him to bring justice to this country. Thus I think he may be open to running as an Independent if not nominated this July. All of us are needed for this political revolution. However, we also need Bernie. I think Trump really, really wants Hillary as a candidate so he could tell some pretty awful things he's found out about her. Your right, Bernie supporters will never back Hillary. Bernie Sanders is the candidate we choose to lead us in making a better future for America. Hillary is a war mongering neocon. That being said, I don't hold it against her, that would be like hating a leopard for having spots. She simply does not represent values we have and no matter how she tries to recreate herself we know she never will. If Hillary really cared about the country as she claims she would drop out now. But for her this isn't about the good of the country, this is about the symbolism of a woman being president no matter what harm she does. No, we will not vote for Hillary and her self serving attitude. Teri, I agree with you wholeheartedly. If Bernie doesn't get the nomination, he needs to run as an independent…and he will win!! I do wonder if that's something he's seriously thinking about at this point. In the beginning I was happy to have either candidate as President. I had researched and taken up for HRC a zillion times, and I still believe rightly so. I even helped an admin on a HRC site for a short time.. In the beginning I was almost turned off to Bernie, though not due to anything he did, but due to his supporters attitudes. While still posting only positive posts about both Liberal candidates, I began scrutinizing their contributions, their sincerity, their consistency to issues,, did they change, were they a cameleon in different rooms, how they interact with others. I kept up with both as they moved forward in the campaign, even checking dates .. who said what and when. That is when I began leaning toward Bernie .. But I still tried reasoning with Bernie supporters .. that IF he did not get the nomination, either would be a better President than any of the GOP candidates. But as things got ugly, to the point of dishonesty, I stopped. The love of my life is a Hillary supporter, and I a Bernie supporter. Politics will never come between us .. But I will never tell a Bernie supporter how to vote again. If (Liberals) loose, the country, perhaps the world will loose, But it is the DNC's fault, it is HRC's, NOT Bernie supporters. Bernie is a once in a lifetime candidate. I am so disgusted with these fake progressives who have voted for her. Even with these fools who have voted for her he still would have won most of the primaries. The system is rigged by the political parties. Both of these parties are the same, and this election has proved that. I will never vote for her and want Bernie to run as a third party candidate. I have no doubt he would win. You take all of the independents, young people and all the Democrats who voted for him, and even a few republicans and I have no doubt he will win. And with each passing day more and more people are realizing what a corporate shill she and the whole democratic party are. There is this nonsensical, fairy-tale view that it's OK to elect Clinton because "Bernie has moved her to the left." Booshwah. He may have moved her campaign rhetoric to the left, but once elected she is still Hillary Clinton. Let those who comfort themselves with the blather and useless posturing of anything said during a campaign remember candidate Obama, his promise to prosecute banksters, his "belief" that "folks have a right to know what's in the food they eat," his immersion and championing of trade deals that advantage large corporations over labor, his USDA and FDA failures to protect the American public, his useless DOJ, and his continued commitment to overseas wars that history has shown only increase the problem. Thanks, Teri…I've copied your comment to refer to if/when necessary! Supporting HRC is like asking a healthy person to take chemo. Who would drink the poison voluntarily? NO ONE, and neither are the BERNIACS! Berniacs care about the future of our country and are unwilling to perpetuate the decline of our society, accepting crumbs because that is all "we can get". It is better of starving than eating those crumbs. NO we REA READT FOR THE REVOLUTION because ENOUGH IS ENOUGH! Voting for the lessor of two evils is STILL voting for evil! The Green Party (Stein) invited Bernie to the top of the Green ticket this week. If he were to take it, he'd be the instant frontrunner and on likely all 50 ballots in November. He would propel the Green party in to a major party and likely win the White House, as well as set a foundation for his legacy. First, either I am totally ignorant or there are two different media themes going on about the campaign. I am hearing that we still have a shot at this, and am also hearing that it is nearly impossible and that he should give up. I prefer to follow my critical thinking and believe that there are a lot of smoke and mirrors going on to influence people. I think he still has a chance at this, and believe it could be detrimental to talk otherwise. But for sake of conversation, It seems like Bernie has already committed to staying a Democrat if he loses. How can he save face and switch to Independent ? I think it would take some serious discussion to get Senator Bernie to steer the ship in another direction after he has already committed. Some state's cutoff dates to be placed on ballots as Independent occur before the July Dem convention. I believe Texas' cutoff is in May, for instance. Granting every word in the column and every word in all of the comments above, can I then correctly interpret that you all wish to see Donald Trump as the next president? Serious question from someone who has not always been called a realist but am feeling like only one in the room at this point. The next president will likely appoint anywhere from one to three (or more) new Justices to SCOTUS. How catastrophic are you willing to go in order to make political points? When have good people ever gotten everything they wanted in politics? How will you feel the morning after on this November 9 knowing that we will be embarking on November 8, 2000 all over again only a lot worse? Polls show that Hillary struggles to win versus Trump, because more independents will vote for "something new" over the establishment. However, polls also show that independents overwhelmingly prefer Sanders to either Hillary OR Trump (or Drumpf if you prefer). Sanders has bipartisan support and can win if nominated. $chillary can't. JimZ, reading these comments are very scary. I had really hoped that if Bernie didn't get it then those supporters would understand what is happening and vote Hillary. It sounds like there is a group think going on that would rather see Hillary lose out of vengeance than be wrong or for their candidate Bernie to lose. I have been a strong Bernie supporter, but not to the point of railroading the entire Democratic party. That isn't what it is about. It is alarming that these people do not understand what is at risk if a Republican wins! Our medical would be gone and we would very likely have another war. Terrible hardships would be be places on immigrants and minorities that would cause tremendous suffering. NO…..Bernie is NOT that important. It is really terrible if this is what this whole process has created and I won't be thanking Bernie or his supporters if we lose our medical and our borders are closed. Ninette, I, too, caucused for Bernie (as did my wife), but I guess having been through enough election cycles, I can identify suicidal political behavior when I see it. I am very disappointed that Bernie probably won't be the nominee. But on Nov. 8, for the future of the country, job one is to keep Trump out of the WH. That doesn't happen if half of liberals, progressives, etc. either refuse to vote or play the 3rd party game. The horror of trump plus a GOP congress (particularly Senate) is too palpable.